Gray Gaulding picked up the 4th last-place finish of his Monster Energy NASCAR Cup Series career in Saturday’s Federated Auto Parts 400 at the Richmond Raceway when his #52 Live! Hotel & Casino Ford fell out with brake failure after he completed 289 of the race’s 400 laps. The finish, which occurred in Gaulding’s 49th series start, was his third of the season and first since the night race at Bristol, four races ago. In the Cup Series last-place rankings, it was the 26th for car #52, the 77th because of brake failure, and the 684th for Ford. Across NASCAR’s top three series, it was the 52nd for the #52, the 157th from brake failure, and the 943rd for Ford. The run, Gaulding's third-straight last-place run for as many different teams, vaulted him to 2nd in the 2018 LASTCAR Cup Series Championship, one finish away from taking the lead from Corey LaJoie on a bottom-five tiebreaker. Following his early exit at Bristol, Gaulding had been slated to run StarCom Racing’s #99 a second time at Indianapolis, but the team withdrew, perhaps in anticipation of the heavy rains that wreaked havoc with the weekend. Richmond would mark the first time Gaulding had been entered in NASCAR since. He would drive Rick Ware Racing’s second “open” car, a ride which debuted at Sonoma. The car was originally slated for B.J. McLeod with sponsorship from Jacob Companies until Gaulding was swapped in on Thursday. 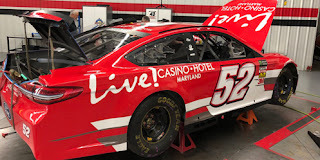 In place of the Jacob backing, Gaulding’s car would carry a new look with sponsorship from the Live! Casino and Hotel outside Baltimore. He would also be teamed with XFINITY Series regular Cole Custer, making his third and final Cup start of 2018. Custer would impress in qualifying, running 14th in Round 1, then jumping to 3rd in Round 2 to make the final round. Custer’s #51 Jacob Companies Ford would line up 10th, far and away the best Cup qualifying effort by Rick Ware Racing (previous was a 26th at Pocono by McLeod earlier this year). The team’s overall best remains 8th, earned both in the Truck Series by Michael Dokken at Loudon on July 8, 2000, and by Kerry Earnhardt in the XFINITY Series’ round at Daytona on July 3, 2009. Custer would finish 26th. Throughout the weekend, however, Gaulding was unable to match Custer’s pace. He started the weekend 38th on the time sheets in both the first and second practice, then qualified 33rd with a speed of 117.739mph (22.932 seconds). With exactly 40 starters for as many spots, no drivers were sent home after time trials. The 40th starting spot changed hands after some post-qualifying technical infractions. The spot originally went to Timmy Hill, who turned the slowest overall lap of 116.989mph (23.079 seconds). However, Hill’s #66 Ternio Toyota was lifted to 37th by race day as three other starters lined up behind him: Round 1 winner Daniel Suarez (#19 Comcast Toyota), 33rd-place Regan Smith (#95 FDNY Foundation Chevrolet), and 27th-place David Ragan (#38 The Pete Store Ford). 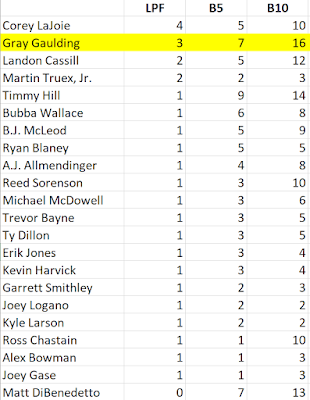 With Suarez, Smith, and Ragan’s laps disallowed, Ragan took the 40th spot on Owner Points. Kyle Busch, originally listed in the 11th spot, was sent to the back for unapproved adjustments after he smacked the wall on his qualifying lap, forcing the team to make repairs. At the end of the first lap on Saturday, Smith, Suarez, and Ragan were already up to 33rd through 35th with Busch even higher up the rankings. The last spot now belonged to Alon Day, the Israeli champion of NASCAR’s Whelen Euro Series, who was returning to the Cup Series for the first time since his debut at Sonoma last year. Then as on Saturday, Day drove the #23, now under new management with Front Row Motorsports and carrying sponsorship from Best Bully Sticks. Day held last for the opening stint, but was catching 39th-place Hill on Lap 15. The two were still nose-to-tail on the 17th circuit when race leaders Kevin Harvick and Martin Truex, Jr. caught them both in Turn 1, pulled to the outside, and put them a lap down. Day lost a second circuit by Lap 35, and a third by Lap 53. The next contender was Joey Gase, who was swapped into StarCom Racing’s #00 Eternal Fan Chevrolet, moving regular driver Landon Cassill to the #99 StarCom Fiber Chevrolet. Following a weekend of promotions where Gase’s sponsor celebrated their contributions to Richmond Raceway’s redevelopment, Gase took last by Lap 59 following a pit stop for four tires and a right-rear wedge adjustment. Gaulding then entered the battle on Lap 72, followed by Cassill on Lap 73. Gaulding, who had earlier raced Hill for the 38th spot, retook the 40th spot on Lap 81. He would hold it for the rest of the night, though would not lock up the spot until much later. Saturday’s race featured several long green-flag runs, and much of the pack found themselves multiple laps down. Gaulding lost his sixth lap on Lap 96, just before the end of Stage 1. He lost his seventh on Lap 130, his eighth by Lap 154, and was up to 11 down after he completed a Lap 175 pit stop. He’d lose a 12th just before the end of Stage 2. Past the halfway point, Gaulding went down a 14th time by Lap 231, a 14th by Lap 249, a 15th by Lap 268, and a 16th after his next pit stop on Lap 275. The 17th came on Lap 283, and an 18th on Lap 300. Jeff Gluck then reported that Gaulding had flames coming from the right-front wheel of his car, forcing the Ware team to call their driver to the garage. The #52 made the left turn on Lap 309, averting a caution. The crew radioed that they had difficulty summoning fire crews to the scene to extinguish their smoldering brakes, and it was some time before the crew could remove the right-front wheel. The team then said they would let the car “cool down” before inspecting the brake lines. But by Lap 325, Gaulding had been pulled off RaceView, and was listed out on NBC Sports’ leaderboard by the final 35 laps. Other than a late spin by 37th-place finisher Jeffrey Earnhardt in the Gaunt Brothers’ #96 Xtreme Concepts / iK9 Toyota, the race remained clean to the finish with Gaulding the only retiree. Timmy Hill took the 39th spot, 18 laps down to race winner Kyle Busch. Day ran 38th, one lap in front of Hill, with Earnhardt and 36th-place Landon Cassill another four laps in front of Day. 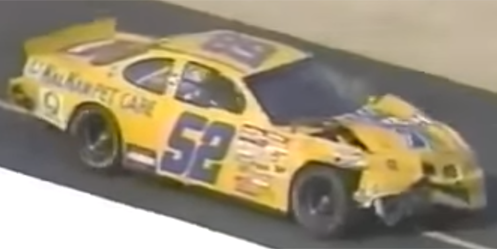 *Prior to Saturday, the #52 hadn’t finished last in a Cup Series race since November 10, 1996, when Truck Series champion Jack Sprague, driving a Pedigree / Kal Kan Pet Care Pontiac, was involved in a two-car accident after 23 laps of the NAPA 500 at Atlanta. The race was Sprague’s second Cup start, one week after piloting the Rick Hendrick-prepared machine to a 23rd-place run at Phoenix. *The #52 hadn’t finished last in a Cup race at Richmond since March 8, 1992, when Jimmy Means/ Funshine RV Pontiac lost the engine after 93 laps of the Pontiac Excitement 400. 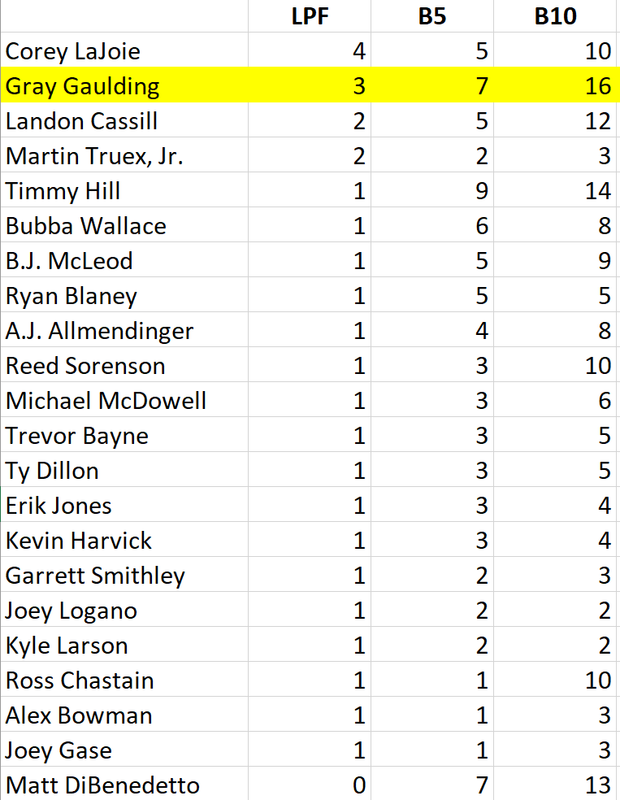 *The 289 laps completed by Gaulding are the third-most by a Cup Series last-placer at Richmond, trailing only A.J. Allmendinger’s 335 laps on September 7, 2008 and Reed Sorenson’s 390 laps on April 24, 2016. Gaulding's entrant should not be compared with Custer's though (in my opinion) because even though the 51 of Custer was entered as a Rick Ware Racing car, it was actually a Stewart-Haas entry with full backing and technical support of SHR. It's clear Stewart-Haas Racing was helping Custer, but I didn't want to speculate as to the extent. Still, with Ware as the listed car owner, I credit the qualifying run as his team's best.